It's the first Tuesday of the month, and that means it's time for another edition of #TwelveLoaves! Our host this month is Karen from Karen's Kitchen Stories, and she's chosen Jewish Breads as our theme. Beyond bagels, Bialys, Challah, Babka, rye and matzo, I'm not familiar with many other types of Jewish bread, so I was really looking forward to this challenge. I swear, the hardest part was deciding which type of bread to make. I've had Bialys on my to-make list forever. And while I've made rye before, I don't think I've ever made a true Jewish rye. I considered making a non-yeast bread like Matzo or Mandelbrot. I used to make bagels every weekend. Something intricate like a beautiful Babka or braided Challah just seemed like too much in this heat since our air conditioner is broken, making it a disgusting 86 degrees in the house without the oven on. After taking a few peeks at what everbody else was making for the month, I set out in search of something that was not too intricate (so I wouldn't sweat more), but still yeasted (because I was in the mood). While my library is typically a reliable resource for cookbooks from any cuisine or specialty, they didn't have any books featuring Jewish bread—and by the time I got serious about making my choice, it was too late to order anything from Amazon. To the land of Google I went. Although I couldn't find a whole lot of information on it, I came across a type of bread that, according to Jewish Food Experience, is typically eaten by North African Jews during the Hebrew calendar month of Tishrei (especially to break the Yom Kippur fast). Apparently the Tunisian variety was traditionally leavened with baking powder, and the Libyan version with yeast—boulou stemming from the French "boule" (round shape of the bread)...though mine is more ovular. 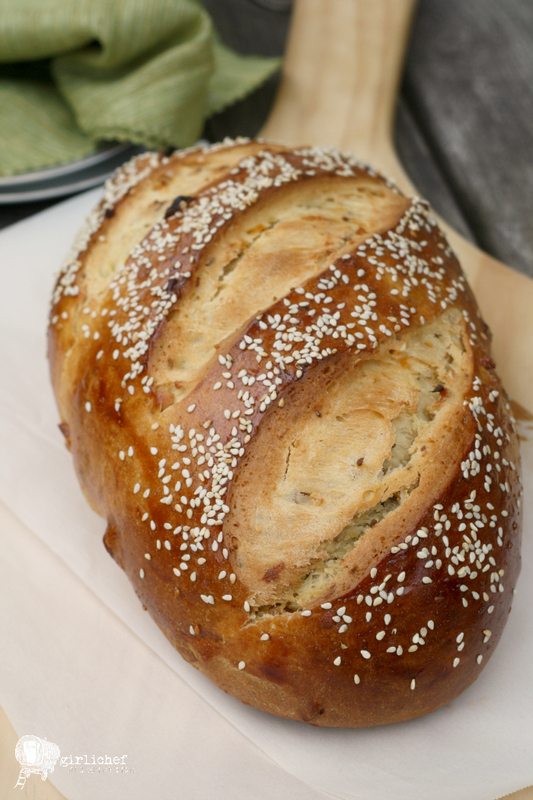 This version resembles challah, and I wanted to go this route since my husband loves bread in this style—sweet (though not too sweet) and almost cake-like in its density. I love that it's studded with fruit, nuts and seeds, adding flavor and texture to each bite. 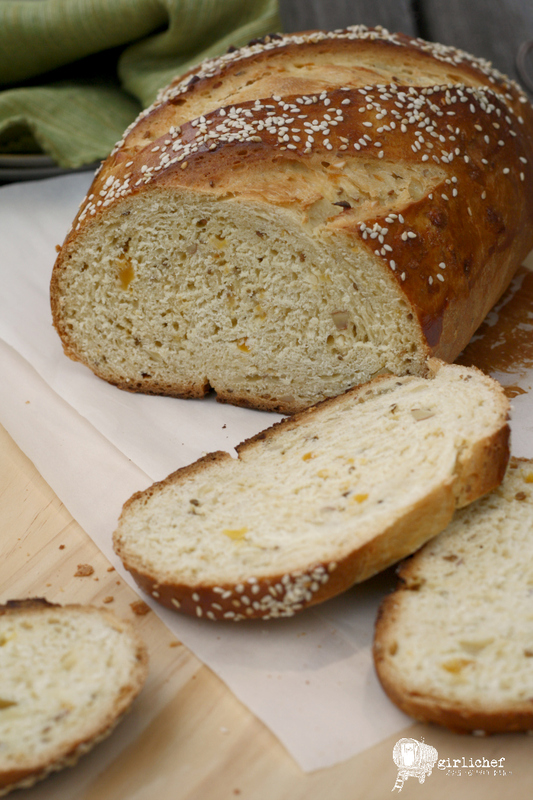 It's also accented with a frangrant whisper of orange and anise, making is somewhat irresistible. Best of all, for me in this heat, is that I adapted it so that I could make the dough in the dough machine to reduce "sweat factor". All I had to do was shape and slash it, neither of which took any amount of exertion on my part. Sure, I still had to turn on the oven, but I made sure that I made this first thing in the morning, before I the oppressive heat of the afternoon could sway me in another direction. How was it? Fantastic! It's dense, but not heavy. It's sweet, but not dessert-sweet. And for being an enriched bread, it's fairly delicate. I can see how it might be a fast-breaker. 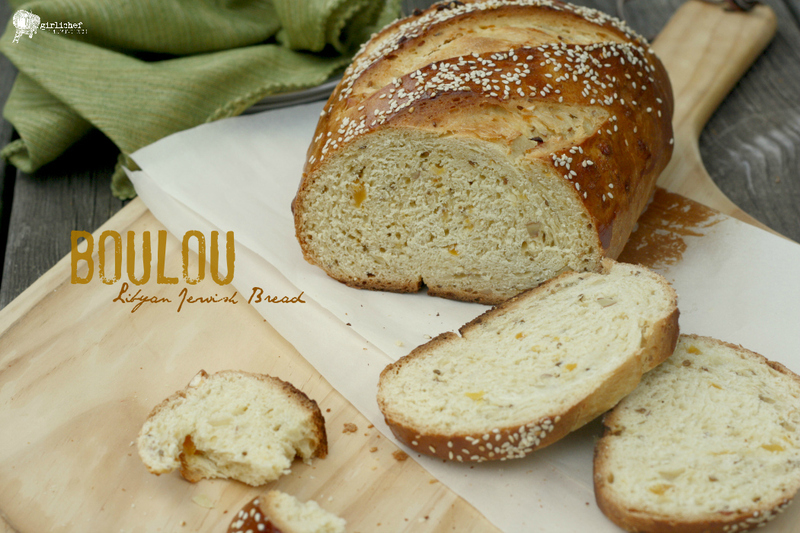 While Boulou doesn't necessarily need to be "subtitled" Libyan Jewish Bread, I did so in order to draw attention to the Jewish population that it relates to. I went back and forth trying to decide whether it would be better to say "Libyan Jewish Bread" or "Jewish Libyan Bread". Both sound right AND wrong once you say them enough times. Let me know if you think I described it incorrectly. If, like me, you didn't realize there was (once) a Jewish population in North Africa, here are a few resources to read more about the final exodus of the Libyan Jews, Jews still not welcome in Libya (a 2011 CBS News article), and the Jewish people in North Africa. I know these just touch on the subject, so if you have any great resources, feel free to link to them in the comments section. 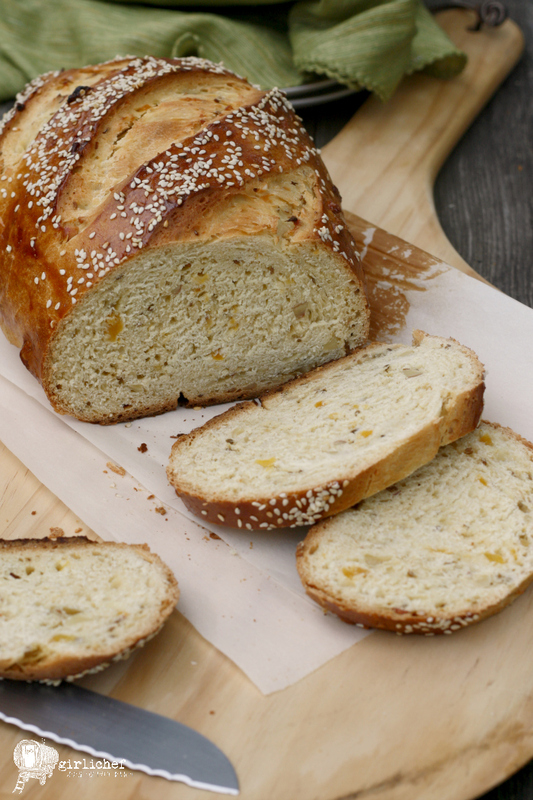 Boulou is an enriched Challah-style bread studded with fruit, nuts and seeds, and scented with orange and anise. Add ingredients to the pan of a bread machine in the order listed, stopping at the yeast. Select the dough cycle and press start. 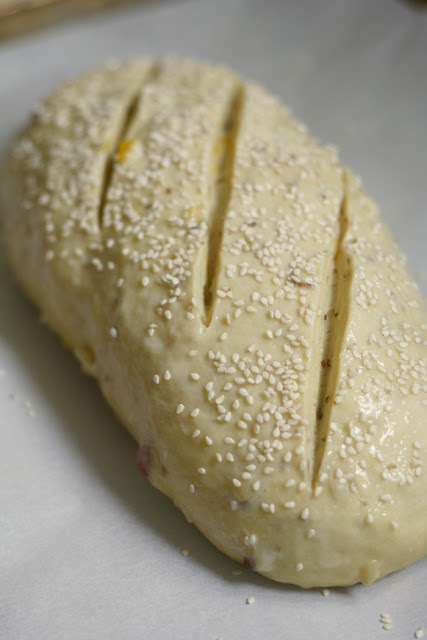 When 5 minutes remain in the kneading portion of the dough cycle, add the almonds, apricots, sesame seeds, and anise seeds to the machine (dough should be tacky to lightly sticky). Allow machine to finish kneading and rising. Turn dough out onto a lightly floured work surface and shape into a squat oval, tucking the ends under. Set on a baking sheet lined with parchment paper. Cover loosely and let rise at room temperature for 45-60 minutes, or until puffed (it won't double in size). Brush the egg white over the dough and sprinkle with a light smattering of sesame seeds. Use a serrated knife or lame to make three diagonal slashes across the top of the loaf. Slide baking sheet into hot oven and bake for 40-45 minutes (or until it registers at least 190° F on an instant read thermometer), tenting with foil during the last 15 minutes if it's getting too dark. Transfer loaves to a wire rack and allow to cool for at least 15 minutes before slicing. 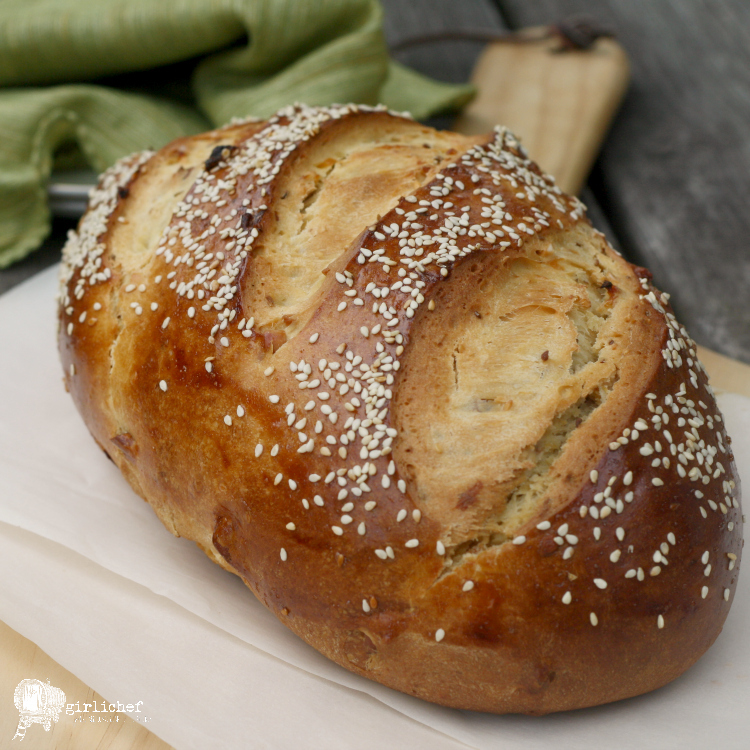 Our host this month is Karen from Karen's Kitchen Stories, and our theme is Jewish Breads. 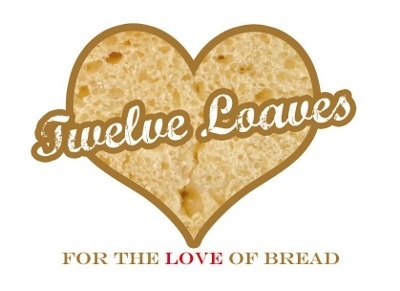 For more bread recipes, visit the #TwelveLoaves Pinterest board, or check out last month's mouthwatering selection of #TwelveLoaves enter last month's "A Little Something Sweet" Breads!